The brutal heat wave that gripped the Bay Area over the weekend is on its way out, but air quality will continue to be an issue of concern Monday. Pete Suratos reports. The brutal heat wave that gripped the Bay Area over the weekend is on its way out, but air quality will continue to be an issue of concern Monday. 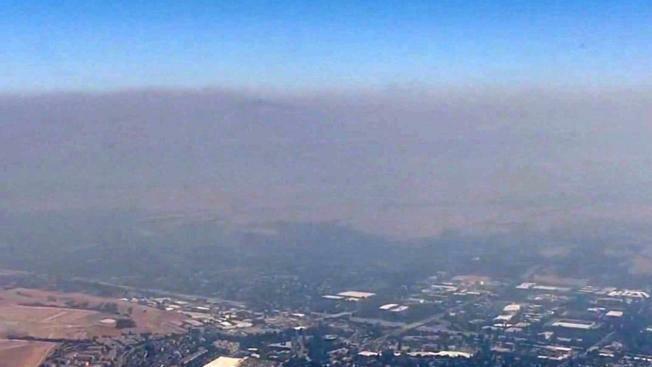 Smoke pouring in from Northern California wildfires coupled with lingering warm temperatures prompted Bay Area officials to declare a fifth-consecutive Spare the Air Alert for Labor Day. The Bay Area Air Quality Management District encourages residents to limit their outdoor activities, recirculate air in their homes and cars, keep windows and doors closed, and head to cooling centers in order to stay away from the smoke-filled air. Elderly people, children and those with respiratory issues are the most likely to be impacted by the unhealthy air. Hazy skies filled with smoke will likely stick around through the end of the Labor Day weekend, according to officials. After multiple days above 100 degrees, several Bay Area cities on Monday are not expected to exceed the triple-digit threshold, according to the National Weather Service. Livermore is forecasted to top out at 94 degrees, San Jose should reach 87 degrees, Oakland is pinned in for a high of 82 degrees and San Francisco should max out at 76 degrees.